If you have any questions about the OXY ZEN information page below please contact us. This motor yacht OXY ZEN is a superyacht of spacious proportions. This 42 m (136 foot) luxury yacht was built by Fipa Italiana Yachts - Ab Yachts in 2007. OXY ZEN was formerly called the project or yacht name (Ab Yachts 140). She could be described as a recent sports style yacht. Superyacht OXY ZEN is a sumptuous yacht that can sleep up to 10 people on board and has around 8 professional crew. The firm of naval architecture responsible for this yacht's drawings in respect of this ship is Studio Arnaboldi and Ab Yachts. Studio Vafiadis in addition was responsible for her interior design. OXY ZEN is the first 140ft motor yacht launched from the AB Yard in Italy which is part of the FIPA Group which also encompasses Maiora and Intermare. She is an impressive open style yacht with bold sleek lines and offers an impressive cruising speed of 46 to 53 knots. The yacht's general design work came from Studio Arnaboldi and Ab Yachts. The professional naval architecture plans are the work of Studio Arnaboldi. Motor Yacht OXY ZEN received her stylish interior designing from the interior design skills of Studio Vafiadis. 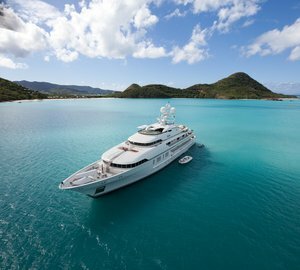 In 2007 she was formally launched with triumph in Massa and following sea trials and finishing touches was afterwards handed over to the new owner. Fipa Italiana Yachts - Ab Yachts completed their new build motor yacht in Italy. The hull was constructed with vtr / kevlar / carbon. The motor yacht superstructure component is fabricated largely with composite vtr and kevlar and carbon. With a beam of 8 m / 26.25 feet OXY ZEN has spacious size. She has a reasonably shallow draught of 1.22m (4ft). The motor yacht for its propulsion uses triple responsive MTU main engine(s) and can reach a exciting max speed of 46 knots. The engine of the yacht produces 2400 horse power (or 1790 kilowatts). Her total HP is 7200 HP and her total Kilowatts are 5370. OXY ZEN is propelled by tripple water jets. Her magnificent cruising speed is 43 knots which produces a range of 500. Bestowing chambers for a maximum of 10 visiting passengers spending the night, the OXY ZEN accommodates them comfortably. The boat requires approx 8 capable yacht crew to manage. 41.6 metres / 136.48 feet. Cruising at a speed of 43 nautical miles per hour. 46 nautical miles per hour. 500 at a speed of 35 knots. Onan 2 times 40 kilowatts, 1 times 20 kilowatts. The luxury yacht OXY ZEN displayed on this page is merely informational and she is not necessarily available for yacht charter or for sale, nor is she represented or marketed in anyway by CharterWorld. This web page and the superyacht information contained herein is not contractual. All yacht specifications and informations are displayed in good faith but CharterWorld does not warrant or assume any legal liability or responsibility for the current accuracy, completeness, validity, or usefulness of any superyacht information and/or images displayed. All boat information is subject to change without prior notice and may not be current.